As god of the sun and goddess of the moon, Apollo and Artemis were created to rule the world of light, together, forever. But now Apollo's brilliance is piteously dimmed. Even more frightening, he is stupendously angry as only a mighty god can be! His beautiful love, Artemis, has been snatched away in a jealous rage by the beast-god Typhon, ruler of darkness! Apollo swears to rescue his goddess. He vows to withstand horrors, monsters, and catastrophes -- or perish! He grasps his sword of light and leaps on Pegasus, his winged charger. Up into the sky they bound -- but to where? Where is Artemis? Then a voice -- distinct, clear, mysterious -- comes to Apollo. "My love, I am in Typhon's Temple, a wretched captive turned to stone! Only my heart can cry for you. Until you save me, my life has ended! You must face horrendous wretches and terrifying creatures, all waiting to tear you apart! And in the temples lurk evils of incredible power! But you must come! 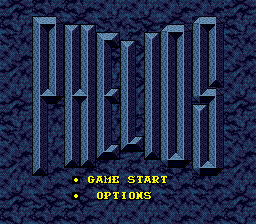 Phelios, the sword of light, is here! Restore its powers with your courage, and save me!" --From the Genesis Phelios instruction manual.